REGISTRATION: You may register by mail or reserve a place by e-mail or phone. Register early, as space is limited (class size is usually limited to 4 students but may go up to 6 with the exception of our Holiday Cards and Introduction to Letterpress workshops). Tuition payment reserves your place in class and is due in full before the start of a workshop. Please provide your name and contact information via e-mail and/or mail with check. Checks payable to: Intima Press, LLC. Mail to: 32 Union Square East, Suite 310, New York, NY 10003. Or, PayPal payment or Chase QuickPay to intimapress at yahoo.com. E-mail questions or call to inquire at 917-412-4134. We’re happy to recommend the right workshop for you! EQUIPMENT: Studio equipment includes a Vancercook Universal III automatic motorized letterpress with adjustable press bed – max. sheet size 18×24 for printing linocut, woodcut, engraving plates, photopolymer plates, wood & metal type; antique foot-pedal press (turn-of-the-century, clamshell style from 1888) 9×12 chase; Golding Official clamshell press 4×6; Ettan Etching Press; Book press; Precision, electric guillotine; Great selection of foundry type, monotype, wood type, ornaments; Library of artist’s books, book exhibition catalogues, chapbooks, and books on typography. LOCATION: The Studio is located at 24-32 Union Square East, on Park Avenue South, between 15th & 16th Street, on the 3rd Floor, Studio #310 (elevator north bank). Trains: 4, 5, 6, L, N, Q, R, W to 14th Street, Union Square. Buses: M 1, 2, 3, 5, 6, 7, 9, 14, 101, 102, 103. Please note: Studio hours are By Appointment Only. ACCOMMODATIONS: Planning to spend the weekend in the City? Ask us about our recommendations for accommodations just around the corner from the Studio and other parts of Manhattan! CALL: Please call the Studio 917-412-4134 to inquire about the best classes for your interests. 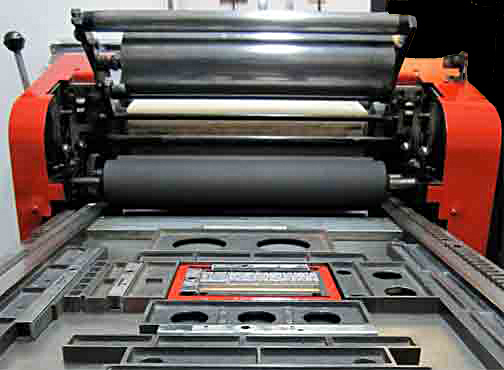 PRIVATE INSTRUCTION: Please ask about one-on-one or group instruction in letterpress printing and the art of the book. We also offer a full, comprehensive business consultation on how to Start Your Own Letterpress Business.